This sermon was given at Saugatuck Congregational Church on December 8, 2013. The texts for this morning were Isaiah 11:1-10 and Matthew 3:1-12. I am going to tell you all a story this morning that some of you might find a little scary. When I was growing up in Southern Evangelicalism, my high school youth group took a trip to New York City. This trip was very explicitly an “evangelistic” trip. We were in New York City to tell people the gospel so that they could be saved. For a week, we were the ones handing out tracts on the subway and walking up to strangers in a park asking them if they knew Jesus. And for all of you with those shocked, uncomfortable looks on your faces, just know that we were pretty uncomfortable, too. One of the most memorable moments of that trip was the day that we set up a prayer station in front of the Public Library in Manhattan. As far as things we were asked to do go, this was probably the least offensive. We sat there all day and simply asked people if there was anything they would like us to pray for. Most people looked at us like we were crazy and tried to ignore us. A few people muttered some sort of response and kept walking. One person told us to pray that people would stop proselytizing. It turned out, as we talked with him, that he was a Catholic Seminarian in the city training to become a priest. He stayed with us a while and talked and prayed, and then when he left we all looked at each other a little confused. It was obvious that this young man loved God and was deeply committed to his faith. But in our southern world, which was dominated by evangelicalism, we were taught that Catholics weren’t “real” Christians. So after our interaction with this young man, we had to ask ourselves “was he really a ‘believer’?”, to use our evangelical parlance. Did he really know God? Because if God could show up in the form of someone who didn’t meet our expectations, then perhaps God could, and was doing, other things we didn’t expect. I think imagining a moment of being challenged like that one is a good place for us to start thinking about John the Baptist’s meeting with the Pharisees and the Sadducees. 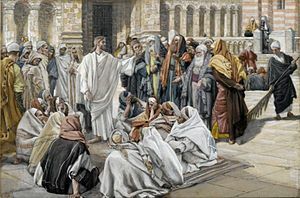 When most of us think of the Pharisees and the Sadducees, mostly because of their portrayal in the gospels, we think of a bunch of mean-spirited pricks. But that’s not really fair. In fact, its a very biased portrayal. The reality is, actually, these two groups were pretty ordinary religious folks for their day. The Sadducees worked in close relationship with the officials who ran the temple in Jesus’ day. And the Pharisees were the largest, fastest growing religious group in ancient Palestine. They were, in other words, the religious establishment in the communities. They were the definition of “normal” for their society. Translate that to today: They were the old, well established churches at the center of town where everyone who was anyone went to worship and nothing too out of the ordinary ever happened. They were the big, popular churches where everyone went on Sunday morning because that’s just what you did. John stands in stark contrast to them. Most of the time in the Bible, we don’t get descriptions about how people looked. But the gospels tell us a fair amount about how John looked. He was dressed in camel’s hair and he was eating bugs. And there’s a reason they tell us that: they want to point out just how strange seeming John was. Translate this description to today’s world: John was that dude with a huge, unkempt beard who sits outside the subway station with a sign that says “The End is Near.” Except he was the really aggressive version of that guy: he’s the guy who doesn’t just sit there with a sign, he comes up while you are waiting for the light to change on the crosswalk and batters you with questions about whether or not you are ready for the end of the world. John is, in other words, the very epitome of someone who we absolutely do not expect to actually have a message from God. God choosing to speak through John is a total curve-ball, it comes as a complete surprise to the religious folks of his day. I don’t know about you, but I would rather listen to Isaiah. To words about peace, about lion’s lying down with lambs, about children playing with wild beasts and no one getting hurt. That’s a much more comfortable a message. Or at least it is at first. Until we are surprised to realize that right in the middle of this idyllic scene is that line about “striking the earth with the rod of his mouth and with the breath of his lips he shall kill the wicked.” Or until we realize that this shoot from the stump of Jesse is growing out of a stump, and if there is a stump, that means a tree had to get cut down first. And that sounds a little bit more like John: “the ax is at the base of the tree,” he said in our reading earlier. How do we get from cutting down the tree to peace on earth? How do we get from striking the earth and killing the wicked to “they will not hurt or destroy on all my holy mountain”? Just as John, the messenger, catches us by surprise, just as the content of John’s message catches us by surprise, so also I think the meaning of John’s message is a surprise if we just dig a little deeper. The thing that is striking about Isaiah’s image of a shoot growing from a stump is that it means that the tree isn’t dead. (cue monte-python: “not dead yet.”) It has been chopped down, but in a surprising turn, it is growing back to life. And the thing that is really striking about John’s image of a fire on the threshing floor is that both the wheat and chaff come from the same stalk. One is kept and turned into bread, the other is tossed into the fire to make space on the threshing floor for more grain. In other words, as shocking as they initially are, these are not images about eternal destruction and they aren’t scenes of hell. Instead, they are about pruning, refining, about pulling out the bad in order to give the good more space to grow. What John challenged his listeners to do was to clear space in their lives, to make themselves ready for something new and surprising to grow in the place of the clutter. So how do we do that? What is the new and the surprising thing that we need to make space for in our lives? If John were here today, what would his message be to us? A good place to start is to ask, what was John challenging those people to do all those years ago, anyway? In our reading, John’s challenge to repent, to clear out space in our lives, is about getting ready for the one that is coming “who will baptize with the Holy Spirit.” In other words, John is challenging his listener’s to get ready for the arrival of God in their midst. He is challenging them to wait for something new and surprising to happen: for God to walk among them. That impending arrival is what we celebrate in Advent, but how does that message speak to us today? How do we make space and get ready for God to be among us? One of the most important ways this message speaks to us is with a challenge to be still, to pause, to take a deep breath, and to connect with God, even if just for a moment. So often this is a season where we are so caught up in the business of life we forget the reason why we are busy. What I think John would tell us today is to be still. To stop moving and simply listen. To wait for something remarkable to happen in our midst. When I was a kid, my mom would take me and my brother and sister to a friend of hers who was also a hair stylist that worked out of her home to get our hair cut. And more often than not, the most common phrase I heard while this haircut process was unfolding was “Sit still, stop moving around so much.” Which wasn’t exactly easy for a 10-year old kid. But it was well-intentioned. Because it was only when I was still that this poor woman who was graciously allowing herself to be inflicted with the three Marshall siblings could actually give me a decent haircut. In a similar way, I think, we each need to find time in our own lives to pause, to be still, to wait quietly during this season of advent as we hope for all that is broken and hurt in this world to be pulled away by the arrival of our God among us. 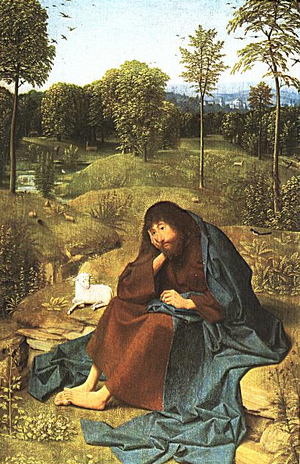 We want to rush around doing the work of making that idyllic scene from Isaiah where there is no more warfare and the lion and the lamb lie down with one another become reality. And that work is good and important work, don’t get me wrong. It is an incredibly important thing that this church has taken upon itself for the last 43 years to provide a feast for those who could not otherwise have one on Thanksgiving, for instance. It is an incredibly important thing that this church and our denomination have chosen to follow the example of figures like Nelson Mandela in advocating tirelessly for equality and justice in our society. It is an incredibly important thing that we have and will continue to do things like clean up the Saugatuck River and run food drives for our local shelters. And to do things like that requires a lot of effort from each of us, and that effort is good and important work for us to do. But in the midst of all of that, I think John would tell us that we need to find time to be still every once in a while. That we need to take a moment to see in front of us not all the work that has to be done for peace to be real but instead to see the God who is going to make it real. The Pharisees and the Sadducees were doing plenty of work to bring about what they thought was the kingdom of God in their time. In fact, a lot of the conflict that they have with Jesus in the gospels is because they have different visions of what that is supposed to look like, not because they think it isn’t worth striving for. What John chastises them for is not that they aren’t doing enough but that they have forgotten the God who told them to do it in the first place. The God we find in those still moments when we can pause and take a deep breath. The God we find in those peaceful moments when we aren’t caught up in the doing but can simply enjoy being. The God we find when we wait long enough to be surprised by something out of the ordinary and new breaking forth into our lives. I heard a story from the Feast last Sunday about someone who had taken the time to get to know by name one of the individuals who came. And when she greeted this woman by name, the guest was completely taken aback. Something new had broken forth in her life in that moment, she had been surprised by a simple gesture of kindness that communicated to her that someone cared. And in the midst of all the incredible work that had to be done to make that feast possible, in the midst of all of that I think this was a moment of true peace, because in that moment it wasn’t about all that needed to be done, it was simply about pausing to say hello to someone who didn’t expect it. It is in those moments, those moments where what lies before us isn’t more work or another project but instead a simple moment of connection, a moment of pause, a moment to breathe, its in those moments that we can find peace and stillness. What I think John would tell us, if he were speaking to us today, is to be still in the midst of all our business long enough to experience that kind of peace. To pause in our work long enough to see God at work around us. To breathe in deeply enough that the spirit of God can move within us. My prayer for us all this advent season is that we will have the chance to experience this peace, this stillness, this waiting to be surprised by God. That we will learn to pause, take a deep breath, and look for the God who inspires us to do the work that we do instead of loosing sight of our very reason for being. That we will all find a connection to this God in the midst of our busy lives that gives us a place to come back to and simply be still. May we find that peace and stillness. Amen.